25 H 822 Private, Cook, Walter K 15 Cavalry, Nov. 11, 1864 Removed from Clarysville.
" 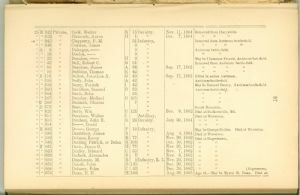 " 832 " Clements, Aaron H 1 " Oct. 7, 1864 "
" " 845 " Clapperty, P. M. 51 Infantry Removed from Antietam battle-field.
" " 846 " Conwan, James 9 " "
" A 6 " Delergue, —— 9 " Antietam battle-field.
" " 19 " Doolan,------ 9 " "
" " 23 " Donahue,------ H 9 " May be Thomas or Francis. Antietam bat. field.
" " 42 " Dall, Robert O. G 51 " Removed from Antietam battle-field.
" " 96 " Donohue, James A 34 " Sep. 17, 1862 "
" " 99 " Dubbins, Thomas E 42 " "
" B 116 " Dalton, Jonathan A, G 49 " Sep. 17, 1862 Killed in action Antietam.
" " 136 " Duffy, John A 42 " Antietam battle-field.
" " 139 " Darry, Patrick I 42 " May be Bernard Dearry. Antietam battle-field.
" " 160 " Davidson, Samuel B 59 " Antietam battle-field.
" " 164 " Davis, John 26 " "
" " 167 " Donoley, Michael B 105 " "
" C 269 " Dudman, Charles 7 " "
" D 373 " Dase,------ " South Mountain.
" " 423 " Davis, Wm. C 121 " Dec. 9, 1862 Died at Burkettsville, Md.
" " 451 " Donelson, Walter I Artillery, Died at Weverton.
" " 453 " Dunham, John R. R 24 Cavalry, July 30, 1864 "
" " 454 " D------, David "
" E 483 " D------, George F 10 Infantry, May be George Dorian. Died at Weverton.
" " 493 " Denfstney, James B " Aug. 4, 1864 Died at Weverton.
" " 539 " Delano, Lacey E 77 " Nov. 20, 1862 Died at Hagerstown.
" " 595 " Dooling, Patrick, or Dolan K 108 " Oct. 10, 1862 "
" F 621 " Davis, James G. H 77 " Nov. 25, 1862 "
" " 625 " Donley, Edward C 55 " Nov. 7, 1862 "
" " 628 " Dudeck, Alexander B 7 " Nov: 3, 1862 "
" " 639 " Dimdonnie, M. E 1 Infantry, L. I. Nov. 24, 1862 "
" " 653 " Danah, John D 145 " Dec. 20, 1862 "
" " 656 " Delaney, John C 57 " Dec. 26, 1862 "
" " 678 " Dunn, R. H. H 168 " Aug. 30, 1863 Age 18.- Maybe Myron H. Denn. Died at Hagerstown.